Ozeki Phone System XE makes it possible to create ring groups efficiently. Ring group feature refers to directing incoming telephone calls to various extensions so that any of the devices can answer it. For this purpose you can define various call routing rules in the telephone system. 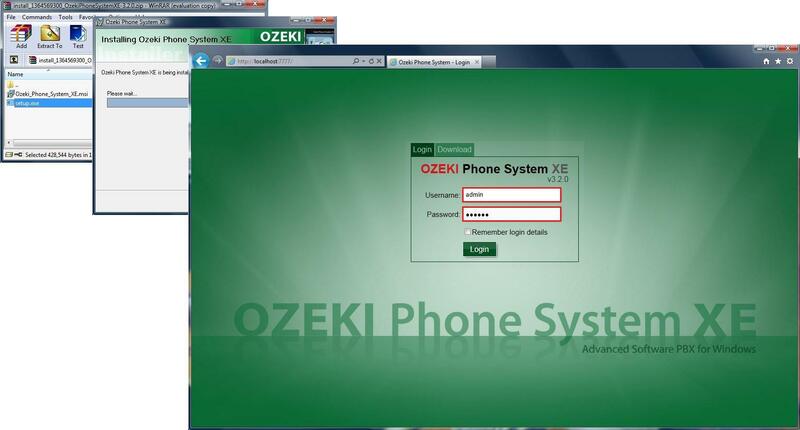 This guide describes how Ozeki Phone System XE helps you exploit this versatile feature. At the early stage of telecommunication, call routing only referred to routing incoming calls to an extension that belonged to the dialled number. While in the modern age of telecommunication call routing offers much more sophisticated and complex solutions. For example, it can be configured that more than one extension needs to ring when there is an incoming call. It is called ring group. The ring group usually appears as a virtual extension in a PBX. In call routing rules this virtual extension can be specified as an outgoing extension. During the configuration of the ring group you can define which telephone extensions belong to the given group. This way, when there is an incoming call all extensions will ring within the ring group. Ring groups are used to call a group of extensions. You can either call them in a specific order or simultaneously. A ring group is recognised as an extension on Ozeki Phone System XE. If you call the extension of the ring group without hanging up the phone, you will call every member of the ring group. Every member of the ring group will be only called once and if nobody picks the phone up, you will be hung up. If you choose to ring in a specific order, phones will be called one-by-one, for example if the first phone is not answering after 30 minutes, you will be send to the second extension. This is a multilevel ring group (Figure 1).When building multilevel ring groups pay attention to the ring time. In every ring group you need to set the ring time. The ring time is the time that passed, while one extension is ringed before ringing another extension. In this example below, the ring time is set to 15 seconds in all the 4 ring groups. However, if you ring phones simultaneously, you will speak the fastest one, who answers the phone (Figure 2). Ozeki Phone System XE offers full support for setting call routing rules, creating and managing ring groups. You can add any number of SIP accounts to the created ring group. Since ring groups are only virtual classifications among SIP extensions, it is possible to add one SIP extension to more than one ring group. The ring groups appear as virtual extensions in Ozeki Phone System XE. This way, ring groups can be defined in simple call routing rules. Due to its simplicity and transparency, Ozeki Phone System XE is the best platform for using ring groups efficiently. Once you created ring groups, Ozeki Phone System XE forwards all incoming calls to the extensions included in the given ring group. When the call is accepted by one of the extensions, the telephone system sets up the communication channel with this extension while stops ringing other extensions. Let's see what you should do in order to setup a ring group effectively. Since the ring group is an extension you need to add it. On the right side of the screen you will see a green box called Extensions. Click 'Add' button to create a new ring group. (Figure 4). On the left half of the screen click on the 'Install' button next to the Ring group label (Figure 5). At the next window, you can configure the ring group (Figure 6). First, you need to add the extension phone number of the ring group, the ring time (in seconds - it is 30 seconds by default), the ringing strategy and the members of the ring group. The ring time is the time which passes while ringing an extension. If the ring time passes, the next extension will ring for the same amount of seconds. RingAll: all the extensions in the ringing group will ring simultaneously, in this situation the ring time only passes once. RingOneByOne: the extensions will ring in the same order as they are in the white 'Current ringing group members' box. Use the 'Up'/'Down' buttons to set the ringing order. The extension on the top of the box will ring first. RingGroupRandom the extensions added to the ring group will ring in a randomized order. If you put a tick in the 'Call member if busy' box, then the member will be called even if he is in a conversation. Congratulations! Now, you can see your new ring group at the Home Screen. (Here, it is 9998, since that was the chosen number)(Figure 8). You can always reconfigure the ring group later on, just click on the 'Open' button next to the extension. If you have installed all of your extensions, you could make a test call. Previously, 9998 was created, which includes SIP extensions 1100, 1200 and 1300. Now, a call will start from SIP extension 1400. (Figure 9). You can notice, that under these extensions there are new messages. 1400 -> 9998 stands for Extension 1400 calls the Ring Group (9998). Since, RingAll was selected, all of the three extensions was ringing at the same time. 9998 -> 1100, 1200, 1300 shows this. Creating ring groups are suitable when rendering multiple phones to a number. This is good if you want the call answered faster, because more people can answer the call. This is also advised if you want the phones to ring in a specific order. For example the phone of the boss will only ring if the secretary can not pick it up. The ring group is an extension in Ozeki Phone System XE, the number of the extensions are the phone numbers of the ring group.